There are “fishy” fish, and then there are non-fishy fish. And with its mild, milky flesh, cod is one of the least fishy of them all. Usually, I’m drawn to the more robust varieties — the mackerels, sardines, anchovies and swordfish in the market, which have enough personality to take whatever seasoning I feel like throwing at them. This gives me the kind of fridge-clearing, spice-sprinkling latitude I need to get really creative. But milder fish can also be appealing, especially cod, which has a fresh, saline taste that can also be sweet. To fully appreciate its subtle flavor, it’s best to keep things simple when preparing it. The good thing about this kind of simplicity is that it can also mean speed. The fewer things you have to chop, peel, squeeze, seed, grind or otherwise deal with when cooking, the faster your dinner will come together. Minimalism is your friend on any given weeknight. 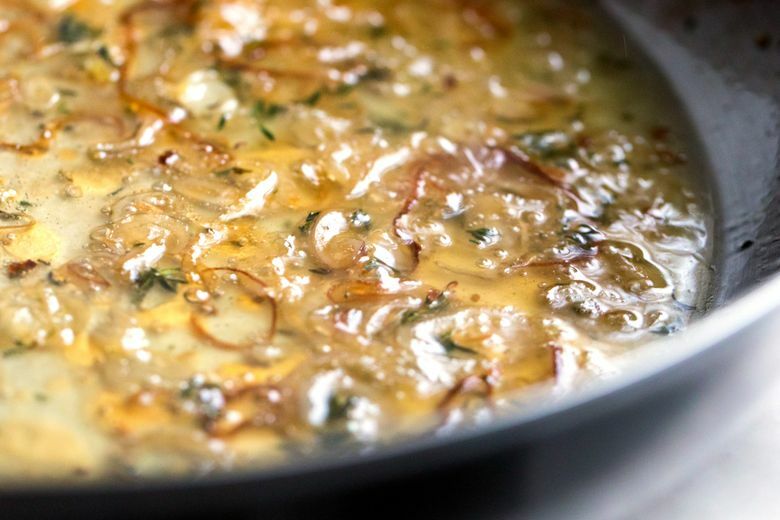 In this recipe, the only ingredients to prepare are shallots, garlic and some fresh herbs: It’s labor you can do while your skillet heats up. Once it’s hot, you’ll quickly braise the cod fillets and shallots in butter, white wine and a handful of herb sprigs. Then, while the fish firms up in the pan, you’ll have ample time to mix the sauce: a swirl of garlic, yogurt and whatever those herbs were that you just chopped. Or you can make the sauce ahead. It will keep for a week in the fridge, and it is so good on roasted or raw vegetables that you might even consider a double batch. That’s it, and the payoff is big: A dinner of meltingly tender, butter-infused cod enhanced but not overwhelmed by the tart, herb-speckled yogurt sauce. Add a spinach salad and crusty bread, or maybe some mashed potatoes if you’re in full-on comfort food mode, and you’ve got a cozy dinner that’s after-work friendly. Like most very simple dishes, this one depends heavily on the quality of the ingredients. So when it comes to the fish, it’s better to go for what looks gorgeous in the market rather than sticking to the recipe. If the cod that’s available seems mushy, choose something perkier and more pristine. Another mild fish — hake, flounder or sea bass — will keep the gentle spirit of the recipe intact. 1. Season fish with salt and pepper and set aside. 2. In a large skillet with a lid, melt butter in olive oil over medium heat. Add shallot, thyme and a pinch of salt and pepper and cook until golden, about 3 minutes. Add wine and cook until slightly thickened and shallot is soft, about 2 minutes longer. 3. Add cod to pan, spoon some of the shallots over top of fish and cover pan. Reduce heat as needed; the liquid should be at a simmer, not a boil. Cook until fillets are just opaque, 2 to 4 minutes. 4. Meanwhile, in a small bowl mix together yogurt, dill, garlic, and salt and pepper to taste. 5. 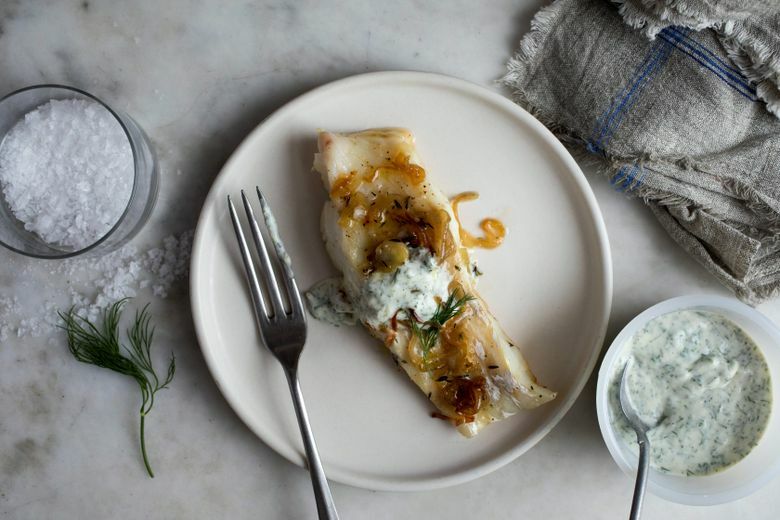 Serve the cod immediately, topped with shallots, yogurt sauce and dill. Drizzle everything with a little more olive oil, and sprinkle with flaky salt and more pepper. Note: If using Greek yogurt, thin it out with a little milk or water. Sheep’s milk yogurt, if you can get it, has an especially nice tang in this recipe.